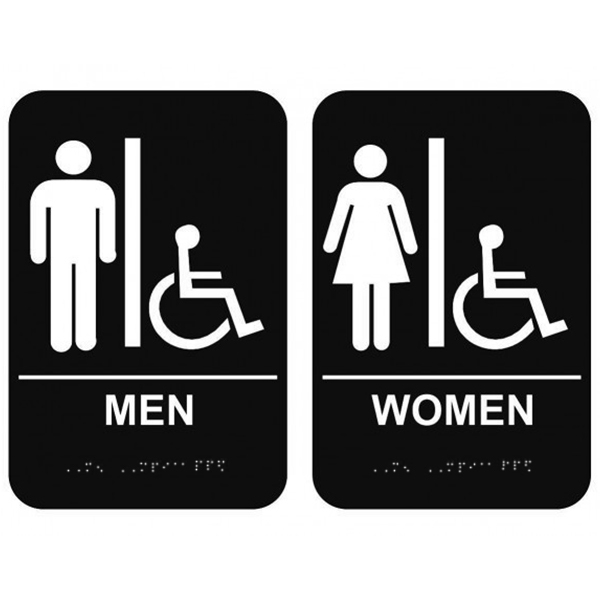 Men's & Women's Handicap Restroom Sign Set ADA-Compliant Tactile Braille - Black 6" x 9"
Set of fully ADA compliant tactile handicap restroom signs with braille. These black signs measure 6" x 9" with rounded corners and adhesive backing. Set of fully ADA compliant tactile handicap restroom signs with braille. These signs measure 6" x 9" with rounded corners and adhesive backing. Standard black signs easily match various types of business decor. Each sign include a gender and wheelchair pictogram with clear text and braille. Order your to provide clear signage that accommodates handicap, disabled and visually impaired customers and employees.